Thursday June 30. I have a date. 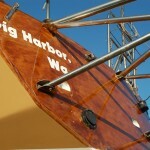 Monday the boat will be lifted by the crane to be able to paint the parts that are now under the stanchions. Then Wednesday I am booked foor “Fleetwood” to be dunked in the Danube. The flexible coupling arrived today from Holland. I will be busy tomorrow getting it to fit, then the shaft needs to be shortened. I figure that with a little luck I’ll have the boat cleaned up and provisioned and leave Friday. If the weather cooperates and the coupling goes on without too much fuss then I will try and make a train trip to Calafat to see my old friends there on Saturday/Sunday. 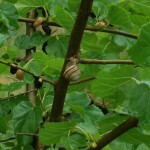 I am still enjoying the Mulberries but now there is a new wild fruit crop growing along the roads. 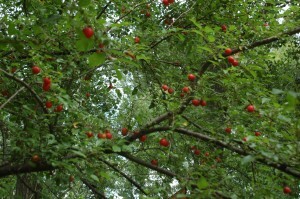 Wild plums. Lots of them. They make great plum brandy, I am told. This morning the first sailboat passed by my river side spot. 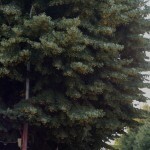 A blue hulled, about 32 foot. I could not distinguish the ensign. Most likely Germans. It makes me even more anxious to be on my way as well. This evening there were two bicycle tourists here at the hotel where I do my internet business. An Englishman, Paddy Byrne (Irish father) and a Breton, Armel. His son is the librarian in Guilvinec, Bretagne, where my cruising friends Klaus and Florence Kroemer live, next to Loctudy where I made my first Continental European landfall, in July 2009. The Frenchman had put a lot of miles on his bike. He left late May from Marseille, went up to Denmark, to Estonia, Lituania, Poland and down to this area, then he will continue tio Istanbul. Paddy is quite a character, he plays the harmonica well and guitar. The Coincidence is that both the Frenchman and the Brit are married to Dutch women… and know to speak some Dutch. Arlan’s wife from Maastricht, Paddy’s from Groningen. It takes a Dutch wife to know that they have nothing to fear from hanky panky on the road when their men ride a 150 plus k.m.’s a day. 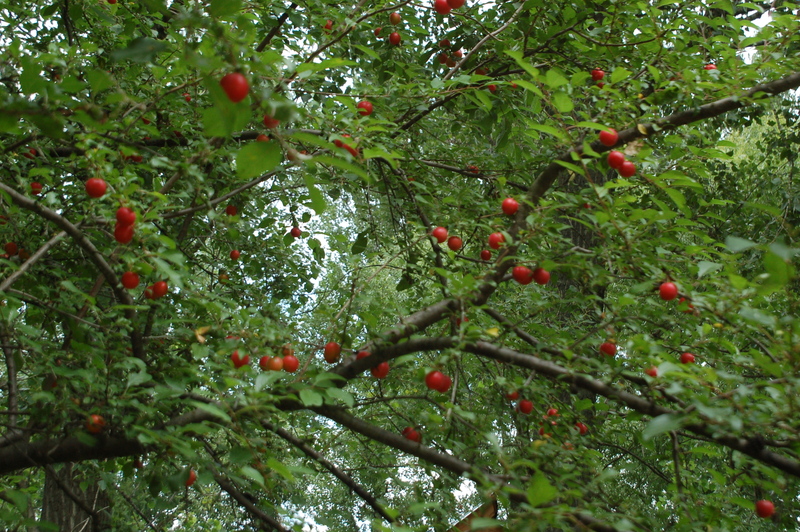 The plums are just a little larger than cherries. All that still needs to be done is painting the bottom. Because anti fouling paint loses it’s toxicity, to the nasty creatures that wish to get a free ride to the Mediterranean and beyond, when the paint is left out to dry for too long, before the dunking, that will be the last item on the list. And just before that the crane needs to pick the boat up and move the stanchions that she is sitting on so that I can paint those sections. The luxury river boat that is being built in the Zim Tub plant for Mr. Nicolae is getting ready for launching as well and I have been told that they will need my spot to launch her from. In a way that is good news because otherwise they might take their sweet time in getting me dropped in the river. It took about two weeks to get the crane time to haul me out, last November. Below a couple more pictures with the decals in place. I am now waiting for the flexible shaft/transmission coupling from Holland that should have arrived a week ago. Last Sunday when I returned to the Romanian side on the ferry from Bulgaria, I spent a half hour with the customs men. They had nothing better to do and I was in no hurry either. They were trying to find when I had re-entered Romania on May 3rd and they wanted to know the details on my arrival and departure for the USA visit, last winter. It took a while. Afterwards I added up the entries in my passport. The passport will expire next year and in the 10 years it has accumulated 102 check in and check out customs/immigrations stamps, 15 Visas (10 countries, 4 for Vietnam) It contains 75 pages. I searched in vain for the exit stamp from the USA last April. And then I realized that the USA is one of the few countries where you do not go through customs/immigration when leaving it. 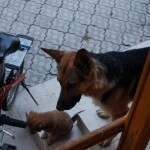 Two weeks ago, Nero, the German Shepherd here at the “ranch” got a new friend. This little fluff ball walked in one day, from no where. Barely weaned. In the morning I have my breakfast on the porch and make my salami sandwich for lunch. They come and join me for a piece of bread and salami. I made it this time to the Roman Catholic mass in Swishtov, Bulgaria. Last Sunday the ferry for some unexplained reason left 45 minutes befor the 9 o’clock departure. It is a small church with about 150 seats. It was 75% attended. The priest was obviously not Bulgarian, I believe Italian, and all was in Bulgarian except a few sung Latin responses. There were two sisters, I believe Sisters of Charity or possibly Dominicans. 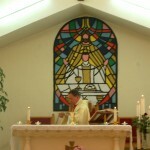 I was able to go to communion for the first time since Amsterdam, 2 months ago. I stopped at the boat first before I took the 9 a.m. ferry and since I had the camera with me I took the below pictures. As soon as I have the name and registration numbers added I will send those pictures. Now I have come up with a new excuse for this color. It is Yemeni/Somalian pirate proof. They will immediately turn away and assume that I am an amphibious Desert Storm vehicle. 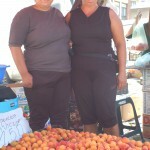 I bought the kilo of Apricots for $ 1.00 from these two sister, in the picture below. The oldest spoke some Spanish and set me down to find out what I was doing in Bulgaria. It has cooled off since Friday night. Last night there was another big party. At 1.30 in the morning 4 or 5 young men mistakenly walked into my cabin, talking loud and their smoke hang around after I pushed them out. I’ll keep it locked. “Desert Storm” camo, Swishtov across the river. The thermometer got up over 40 Centigrade, over 100 Fahrenheit. 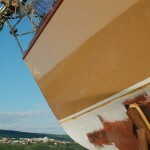 It is nearly impossible to work on the boat other than underneath, or on the shady side. Every tool left out in the sun becomes too hot to touch. I start before 7 a.m. and quit early. Around 2 I could not stand it any longer, I heard the voices and splashing from the beach, a ways down stream. I wear swimming shorts anyway. That brought some temporary relief. The hull, two coats, are done. Now I have to re-install all the hardware again, in the cockpit and on the house. The dodger, traveller, engine controls, etc., etc. And that can only be done before 9 a.m. or after 7 p.m. The picture below shows the system the “Cuckoo’s Nest” has to preheat the water. Kind of Rube Goldberg, but it works, particular in this heat wave. I wonder why that is not embraced in more parts of the world. 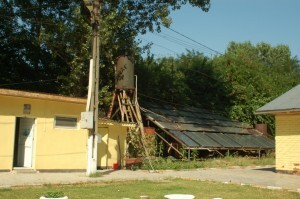 I remember that in Southern Brazil, all the houses had their water tanks on the roof. An hour and 15 minutes ride for the 40 k.m. The 3 car commuter train left at 7.12 and I was done with my business to return on the noon departure. $ 4 round trip. I managed to squeeze my folding bike through the entrance doors. The last time I spent too little time with Camelia there, when we went by car. 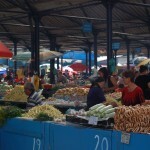 The large town has a very nice, pedestrian only, shopping center and public market. The only reason for going was to collect a GPS antenna that I had purchased on the internet and had Lisa forward to me. I had to clear it through postal customs. 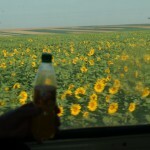 The short ride goes through rolling country side of wheat, rye, sunflowers and corn fields. 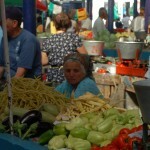 The market represented the current crops, strawberries, cherries, tomatoes, cucumbers, peppers in all colors. This is what I like so much about Romania. The seasonal flowers, vegetables and fruits, last fall the harvesting of the grapes, delivering the winter’s firewood, now the Linden blossoms. There is a cadence, a harmony with the land and seasons. Something that is hard to distinguish in the more “developed?” western society, where the market represents seasons from both sides of the equator, is plastic wrapped or frozen. It is early afternoon and in the nineties. I’ll spend a couple of hours on “Fleetwood” later, I’m not a Mad Dog or an Englishman to go out in the mid day sun, as described by Rudyard Kipling. And on the subject of dogs. 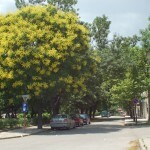 I show a picture of them on Zimnicea’s main street. A couple days ago I was sitting on the sidewalk cafe of the hotel and saw a lady get in her car. 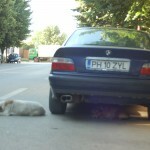 Another dog was sleeping right in front of her car. I figured that starting up her car would wake it up. No, there was a yelping and a terrified driver when she went right over it, but the car barely made a dent in it. Most American cars would have made mince meat out of the Romanian stray. 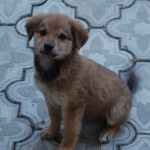 I have become one of the locals because the stray dogs don’t chase me any longer. It is time to move on. After I did yesterday’s blog I went to the grocery store across the street from the Danubia Hotel. On leaving the store a gentleman was sitting under the canopy having a drink. He addressed me in American English. He introduced himself as Dino. He was visiting for the day from Swishtov. So, if the ferry to Swishtov had been on it’s schedule I would have never met Dino. His real name is Constantino (or Costas) Ayiotis a Greek Cypriot who has lived in San Francisco and New York. He told me that he tended the bar at the “Spar Tavern” in Tacoma for a couple of weeks in the seventies. Now that would make for another small world encounter similar to Mike the Vietnamese American I met in Saigon who opened the “Vien Dong” on 38th and Tacoma Ave. If any of you are stopping in there, Roger Rue has his office across the street from the Tavern, ask Kathy Manke if she has any recollection. Dino or Costas is in his mid sixties has done everything and been everywhere. 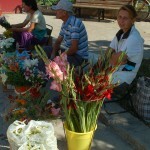 He has a 28 year son with a Bulgarian lady in Swishtov and he enjoys spending time there. We have a couple of things in common, we both have been married three times he has twin daughters. Drinking beer and Vox Maris brandy under the canopy and with the smell of the Linden blossoms at midday when the temperature got up to 38 degrees ( in the nineties..) was a heck of lot better then trying to put a coat of paint on a boat that feels like it is on fire. His Bulgarian companion, Michael, is another character in my next book. He spoke some German, good Russian, Polish, Romanian and even some Dutch. He was 68 and did not look any older than 55. From the reports of the rest of the world I happened to have been in one of the best spots. It started here at around 9.30 p.m. The sun had just set and the moon was just above tree level. 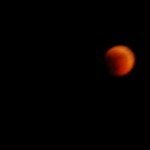 It was large en red like a harvest moon and slowly the eclipse started coverimg the moon. The skies were clear. And I did not have to get up at an ungodly hour, like the last one in November, in Virginia. The only negative is my effort to get some good pictures of it. I had been told that the moon would not rise till 10 and when I got on my way from town back to the summer camp I saw that the eclipse had already started. 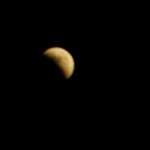 I raced back and set up the camera but by then there was little daylight left and I need this because my magnification 25/200 just is not pulling it close enough for light. I used time exposure on a tripod but that does not give enough detail. But it was a memorable event. 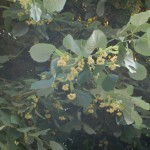 The Linden ( Tilleul) Trees are just starting to bloom. This has to be one of my most favorite blossom smells. It is intoxicating. Last July I was with Jeannine and Gabrielle in Bruges and we experienced this treat, the old ramparts are lined with Linden trees. 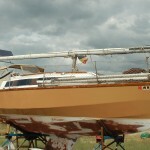 I got some help to day in getting a hose to the boat and managed to hose her down to get rid of the sanding dust. We are supposed to have a couple of days without the thunder showers. So, the fun part starts. Painting. Pentecost. June 12. The Spirit is a-movin but not over every land. I attended the orthodox church service in the hope of getting a feeling of the spirit of Pentecost. But it was just as before. A few old ladies, crossing themselves continuously, lighting candles, kissing the icons, a drone coming from the priest behind the closed doors to the sanctuary. I still do get a sense that I am in the house of the same Lord. But not much else. When I was on my way back to the “ranch”. I heard music and a whistle and some shouting. 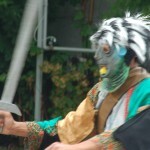 6 young men in tradtional costumes were performing a dance in a courtyard, and then there was this evil looking character. Which turned out to be the Iele. I heard that they performed later in the ttown. They must have just been practising where I saw them. 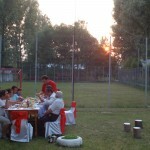 as follows: Traditional Căluş Ritual in the Romanian village.The determined time, for theCăluş ritual is the period of Rusalii (Pentecost) which occurs forty days after Orthodox Easter, and lasted for seven to nine days. 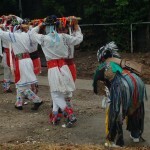 This transitional period from spring to summer is when, according to Romanian and Slav folklore, malevolent fairies, known as were at their most active. 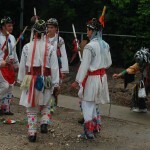 The period of Rusalii was a liminal period in villagers’ lives .